As we begin the new year I thought I'd take a different direction with my post today. I know, this is a food-based/recipe blog, but you might not know that I am an addicted reader too. This year I set a goal to read 100 books, something I haven't accomplished since before my 2 1/2 year old daughter appeared on the scene, and I actually met the goal! A lot of what I read this year spanned 3 major genres: foodie lit, contemporary fiction (which I don't usually get into) and fiction/fantasy (including urban fantasy). I read some fantastic books this year and have set another goal to read 100 books in 2015. 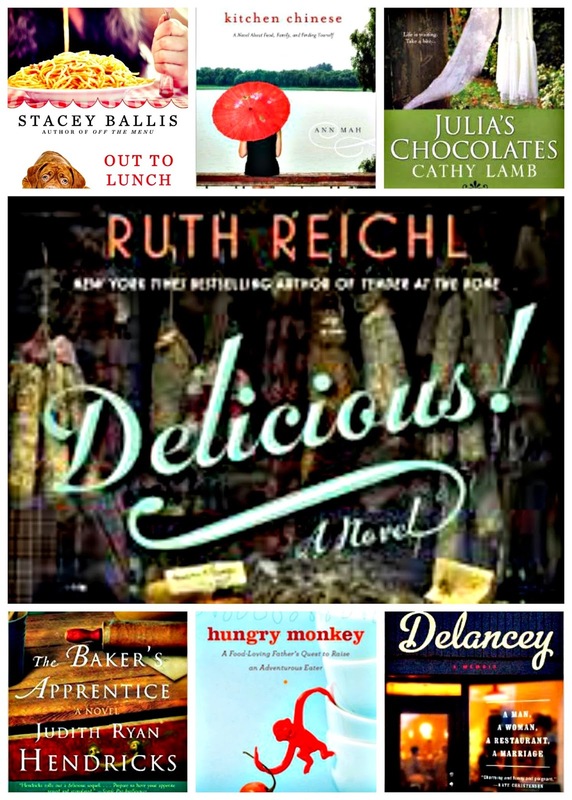 I thought I'd take a few minutes and share with you my top 6 "foodie lit" books that I read in 2014. 1. Out To Lunch (Stacey Ballis) I fell in love with this author's books when I read "Good Enough To Eat" in 2010. Since then I've hunted down all of her books and read them, eagerly awaiting the next novel. This one definitely didn't dissapoint. 2. Kitchen Chinese (Ann Mah) I hadn't read any of Ann Mah's writing until I picked this book up. It had been languishing on my "to read" list for far too long, so I decided to dive in. I wasn't sure if I would really get into it, but as I kept reading I found myself intrigued by a culture I was formerly unaware of. 3. Julia's Chocolates (Cathy Lamb) Switching gears a little, this is more of a chick lit book with some foodie elements thrown in. The characters are vibrant, there's a romance thrown in. It has that great relational tone like the Ya Ya Sisterhood books and the Hot Flash Club books. It was a quick read, but an enjoyable one, and who can resist chocolate? 4. Delicious! (Ruth Reichl) This author may be my favorite foodie lit author so far, I fell in love with her writing when I picked up Garlic & Sapphires in 2011 (was published in 2006) and quickly started hunting down all of her other books. Tender At The Bone and Comfort Me With Apples were also fantastic reads and I couldn't wait to read her latest book this year. 5. Hungry Monkey (Matthew Amster-Burton) I have had this book on my "to read" list for over a year, but never picked it up because of the simple reason that my local library didn't have it available. I wasn't sure if I would like the author, so I didn't buy it. However, my fabulous best friend Becks who lives in the UK and reviews books for a living (jealous! ), gave it to me as a birthday gift. Thankfully she trolls my goodreads account and knew just what book to select for me. 6. Delancey (Molly Wizenberg) Can I just say how much I love this author? I know, with the exception of 2 books on this list, I'm reading foodie lit by authors I already know I love. Well, who cares? I absolutely love their work and I was excited about this book coming out since I first heard it announce more than a year ago! I follow Wizenberg on her blog: Orangette (and you should too), but first was hooked on her story and her writing when I picked up her book "A Homemade Life" in 2011 (published in 2009). Delancey is the story of her and her husband opening up their own pizza restaurant and its a fantastically truthful (and sometimes raw) and emotional accounting of their journey, triumphs and pitfalls along the way. I love it, its a unique look into the restaurant business and she ties it all together with self-awareness and relationships with those she loves. So there it is, my top 6 foodie lit reads from 2014. I am always looking for more, so share your favorites and recommendations for me to check out this coming year! by Fuchsia Dunlop. I'm always surprised by how much I love foodie lit even though I don't cook. There's no one who doesn't love to eat! I have that book on my "to read" list, maybe I'll pick it up this year, thanks! I love foodie lit...and so true, who doesn't love to eat? ?